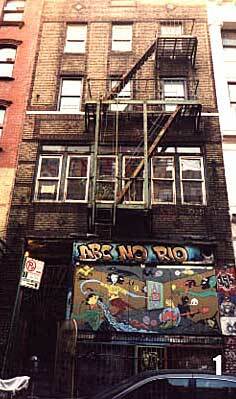 ABC No Rio in lower Manhattan: proving that art can break out anywhere. rtforum recently published two issues about the 1980s. I got so wrapped up in what I read on their Web site that I actually went out and bought the issues. In general I'm not wild about the magazine, though I felt I ought to be. But Artforum often feels like the venue for all those dissertations, theories and degrees acquired on obscure references. Years ago I decided I didn't have to pretend to "get" it or like it and I know I'm not alone. But the '80s  I can get that. At Rich's magazine counter I enthusiastically said "I was there!" as I pointed to headlines of "The '80s" on the cover, and the woman next to me laughed. But of course not everyone was around for this particular '80s, for this is mostly about the New York art world. They say that only now is this era getting any kind of study. Some time must pass. Someone said that the people who will be passing the real judgment and assessment are about eight years old right now. The recent articles are often interviews with artists who came to fame during that decade, and they speak more like survivors or witnesses than anything else. The art world and whatever we expected out of ourselves changed radically in that decade. The role of the artists changed in many ways. Some were good at that and some weren't. One thing that kept coming up time and again was the East Village art scene, how unusual it was, and "a moment in time that could never be repeated." Well, not in New York perhaps. But I see right now in Portland a growing artist-owned scene developing very similarly to what happened then in New York. Everywhere, art: The East Village in the 1980s was what it was. No, we don't have people like Francesco Clemente, major international art stars, moving to Portland ... yet. But all this DIY activity, as it is now called  that running into brick walls of the establishment and the frustration which follows, that opening of your own space and showing your friends' art, well, that is running rampant in Portland. It's an epidemic and it's good. I'll never forget the first time I visited the East Village art scene. There were more than 100 galleries in a very small patch of rundown real estate, and almost every one of those places was run by a non-business person, if you know what I mean. You could literally go from door to door and block to block and find some outsider, some freak just like yourself. It was all one big unrenovated ghetto, but it was all about art. It was in the bars, too, and in the cafes. I remember going to a party at one of those cash-machine lobbies at a bank. All kinds of impromptu things were happening, but nothing amazing. Still, I recall thinking that if this party happened anyplace else, what significance could it possibly have? But it was New York and that was enough. People taking over cash-machine lobbies and doing weird performance art. I'm not here to tell you that it was all good art. I was blown away by how much lousy art there was, and yet, what a loud ruckus it made! But for quite some time afterward, it was not cool to talk about your involvement in the East Village. The short-term assessment was that it was a joke and a free-for-all and bad art. If people had shows there, they took them off their exhibition histories. I never did, as I had too few exhibitions in New York as it was. But I wasn't ashamed of my time spent there, and I had a feeling that history would bear me out. People would eventually look back and be able to recognize that it was a movement of its own. There were unique things about it and, of course, some cream rose to the surface. Some think that nothing major has happened in New York in over 40 years; nothing original and of itself. I don't agree. The East Village art scene gathered Keith Haring, Jean-Michel Basquiat and others who definitely bear the test of time. The particular activity and self-made style was elsewhere for sure but it made a huge crescendo in the East Village. And what happened in that era and that area is still affecting art today. One artist who wants to see that the history gets written is Mark Kostabi, who made his initial mark at the time. In writings on his Web site (and also on Artnet.com) he has made a point of digging up what others buried or minimized. He, along with Baird Jones (a constant fixture in New York), have published "Mark Kostabi and the East Village Art Scene: 1983-1987." One of the reasons that the East Village scene never reached its potential and got panned so much afterward is because most of the greatest personalities died. Basquiat and Haring, Wojnarwicz and Greer Lankton and Cookie Mueller. The list is long. Many of the best and the brightest never made it to any kind of mid-career status. A good epidemic: Zeitgeist is part of Portland's growing scene. But like those days, the most exciting thing about the art activity in Portland today is the number of makeshift spaces. They're all over the city. And once again, it's not really the art itself which is so exciting, but the spirit behind. From that spirit, something substantial is bound to rise. There are shows I have seen, too many to recount, from which I walked away and mused to myself that it was really nothing new and reminded me of the East Village. I had seen it all, as they say. But I know that such a situation is no bad thing and the time and location always assure that things pan out differently. The verdict isn't in yet, but in the process the power and the attention gets redistributed.